In her keynote address during the 19th Dairy Congress and Expo (DairyConEx), Senate committee chairperson in Agriculture Cynthia Villar underscored the significant contribution of the Philippine Carabao Center (PCC) as one of the agencies leading the continuing progress of the local dairy industry. 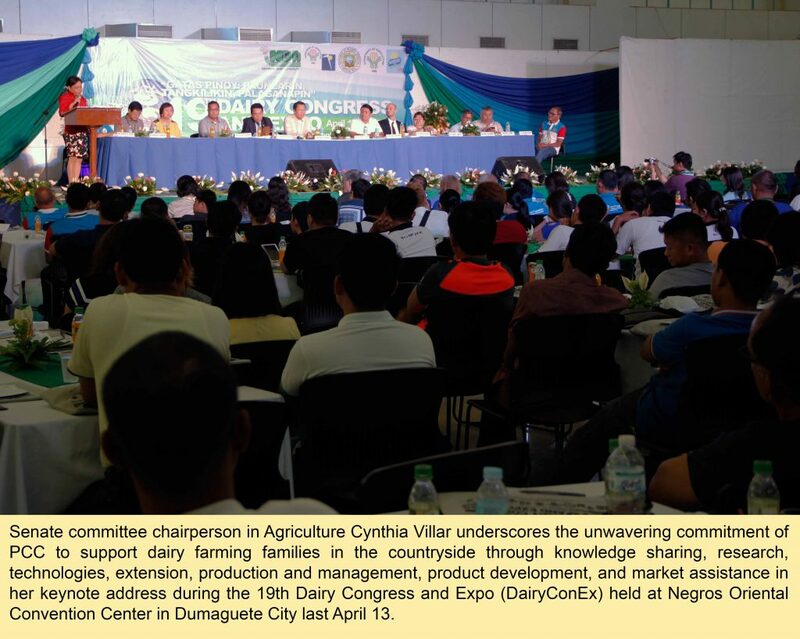 “The Philippine Carabao Center has not wavered in its commitment to support dairy farming families in the countryside through support mechanisms in the areas of knowledge sharing, research, technologies, extension, production and management, product development, and market assistance,” Senator Villar said in her speech at the conference venue in Negros Oriental Convention Center in Dumaguete City, April 13. Senator Villar said more dairy industry players should focus on establishing a tourism farm. The concept of Farm Tourism Bill she said is to teach farmers how to earn from their small farms and to become teachers of best practices as well to other farmers. The foresight of the proposed bill is to increase farmers’ incomes by engaging in multiple business opportunities springing from agricultural tourism. This prospect can also direct the interest of young generations to converge in the countryside with the vibrant promise that is in farm tourism. “I staunchly encourage farmers to become teachers of technologies and practices as well besides being productive farmers themselves. I strongly encourage you to get accredited to TESDA and you can then proceed to converting your farm into a learning farm,” she said. Senator Villar facilitated the provision of a PhP500 million funding dedicated for TESDA agricultural training where all interested teachers of agriculture can get accreditation. “My dream is for farmers to have a family farm school in all 1,600 towns in the Philippines so that more farmers will be taught of how to do farming using the right technologies, mechanization, and how to imbibe a business sense,” she said. Senator Villar said small farms have the potential to prosper but because of lack of business sense, financial literacy, technology, and mechanization, progress is impeded. This is why, she said, education is the key to propel them to sustained development. PCC is already providing such array of support, she said, encouraging small hold dairy farmers to have a “business sense” by creating viable and sustainable carabao-based enterprises in the countryside. “You should not be ashamed that you are small. All great things start by being small,” she said, directing her message to small hold dairy farmers. Senator Villar said with the increasing and growing number of small hold dairy farmers contributing in the national dairy industry, the focus of the government should now be directed to improving their cause through provision of support mechanisms and facilities. “With our concerted efforts, we will achieve our goal of a progressive local dairy industry benefitting thousands of dairy farmers in the provinces,” she said. Agriculture secretary Proceso Alcala, through agriculture undersecretary Dennis Guerrero, agrees with Senator Villar that a progressive dairy industry is one of the keys to economic development in the countryside. Secretary Alcala said support mechanisms for dairy farmers will be continuously strengthened to make this happen through provision of the best technologies and technical and capability enhancement assistance in the span of the value chain—from production to processing and marketing. Efforts of the dairy industry, he said, should be focused on producing quality milk to enable the Philippines to obtain itself a significant share in the world market. “Let us continue to exchange knowledge on dairying and meaningfully contribute in the progress of the local dairy industry,” Secretary Alcala said. PCC acting executive director Dr. Arnel del Barrio vowed the PCC will continue to seize opportunities to realize its mandate of providing increased incomes and improved well-being for the rural farming families by leading the DA network in deliberate efforts to conserve, propagate and promote the Philippine carabao as a source of milk, meat, and draft power and hide, and serve as the lead agency for livestock biotechnology. The 19th DairyConEx, adopting the theme “Gatas Pinoy: Paunlarin, Tangkilikin, Palaganapin!”, was attended by over 600 delegates composed of dairy farmers, cooperative members, private sector and industry entrepreneurs, and government employees in the livestock sector. Some 50 exhibitors participated in the three-day conference to showcase their respective technologies and products. Annually organized by the Dairy Confederation of the Philippines (DairyCon), the congress aims to encourage people to go into dairying to create wealth, livelihood and share the benefits of economic development nationwide. The ultimate goal is to create a permanent sector for dairy with globally competitive professional dairymen and farm workers. It is co-organized by the Department of Agriculture through the National Dairy Authority (NDA) and co-sponsored by the PCC.